Deep in eastern Moravia, in the Czech Republic not far from the border with Slovakia, lies Zlín, the factory town of the Bat'a shoe company, built in the period between the two world wars. It's the brainchild of the shoe magnate Tomáš Bat'a, who was expanding his business on the back of rich profits from supplying boots for the Austro-Hungarian army and wanted his workers to live in comfort in a modern environment. So Zlín has tree-lined streets of flat-roofed houses in the modernist mode. The city is zoned – houses here, civic centre there; parks here, factories there. 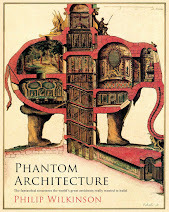 It all owes something to the utopian ideas of the garden city movement, and something else to the modernist Cité Industrielle proposed by the great architect and urbanist, Tony Garnier of Lyon. In spite of this, though, Zlín is Czech through and through. Its principal architects were František Gahura, and Vladimir Karfik. Bat'a's business boomed and Zlín spawned satellite cities around the world, in Canada, India – and Essex, where at East Tilbury a concrete, steel and glass factory was constructed and streets of flat-roofed houses were put up for the workers. Whereas the houses in Zlín are mostly brick, in East Tilbury many of them are pale concrete, so the place looks even more modernist than its Moravian parent. It still surprises me that this place not far from London, where thousands lived in the kind of modernist planned town that is often said to be alien to Britain, is not better known. The first Bata factory at East Tilbury was built in 1933, and it was soon followed by shops, a cinema, sports facilities, a school, and streets of houses for the influx of workers who came to live and work here. As at Zlín, the style of the buildings was modernist – in fact it was the work of the company's own Czech architects including Gahura and Karfik, and it's said that even many of the components for the houses were shipped in specially from Central Europe. 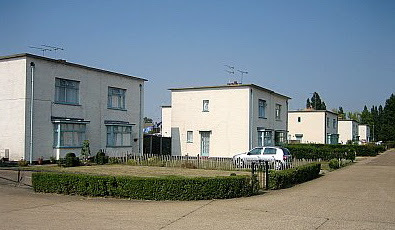 The people who lived here in the early days were a mix of Czechs who relocated to the UK and locals who were pleased, in the hard times of the 1930s, to find a job with a decent wage and a house. After World War II and the coming of communism, the Bat'a business was nationalised in Czechoslovakia but the rest of the company continued independently around the world. The factory at East Tilbury continued making shoes until 2005, when it closed as the company moved production closer to its main export markets. By this time this odd modernist town had functioned for over 70 years. East Tilbury, though never as big as Bat'a intended, and nowhere near the size of the large city of Zlín, was a viable factory town in its day. With the factory gone and many buildings unused, it's a shadow of its former self. But it's a fascinating, and early, example of modernism in Britain, and an interesting example of a coming together of two cultures, Czech and British, that had previously had few close encounters. There is nowhere else in the country quite like it. East Tilbury was featured in Jonathan Meades's latest television programme, The Joy of Essex (BBC4), available for a few more days to those who have access to the BBC's iPlayer site. Linguistic note: In Britain, the company was always known as Bata and is therefore not incorrectly pronounced by Brits as "barter". In Czechoslovakia, and now in the Czech Republic, however, it is spelled Bat'a and the pronunciation comes out as something like "BAT-ya". Gate piers. They're one of the primary architectural signals of large buildings. You see them and straight away the eyes are peeled, the neck is craned. Somewhere beyond there's going to be a big house or somethings else – a school? a hotel? offices? something industrial? And rapidly your buildings correspondent is summing up the possibilities: is this a welcoming gate or one that wants me to keep out? If the latter, is there a gap in the hedge somewhere that offers a view of what's inside? Gate piers, like entrance lodges, are often the prelude to something interesting and exciting. 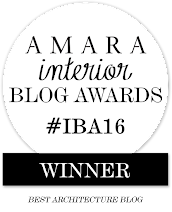 But sometimes, as I've noticed on this blog more than once before, the anticipation can no longer be fulfilled. The gate may be there, but what it heralded has long gone. It is often the way with country houses, which disappeared in their scores in the 1950s, less often with industrial buildings. But these gate piers on the Great West Road are reminders of an architectural loss as great as that of all but the grandest country house. From 1928 to 1980 they fronted the Firestone tyre factory, one of the most spectacular of the Art Deco factories on the western approaches to London. After it closed, it was demolished, during a public holiday in August 1980, just before a listing was due to come into force. 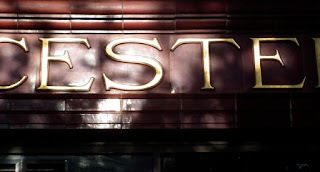 A long white Art Deco front, with big windows separated by white piers topped with colourful capitals; a central doorway with ornate surround in blue tiles; the company name emblazoned across the top in large letters that were illuminated in red neon at night – the factory was a stunner, worthy to be compared with two others that have survived, the Hoover building on Western Avenue and the Carreras tobacco factory at Mornington Crescent. And on a summer weekend in 1980, it all disappeared, save for these gate piers and gates, elegant and very Art Deco reminders of the building and its sad fate. If every cloud has a silver lining, the consolation here is that the factory's demolition galvanised campaigners and architects to look out for other vulnerable 20th-century structures. The Thirties Society (now the Twentieth Century Society) had been founded in 1979 to protect buildings of what was then an under-appreciated period in British architecture. News of the Firestone demolition focussed public opinion, led to the listing of many important 20th-century buildings, and helped 1930s enthusiasts convince people of the merits of such structures as lidos, 1930s underground stations, and telephone boxes. The Firestone gate piers are a reminder of what it took make people realise what they could be missing. From their origins in the 1640s until the late 1680s, the Quakers were persecuted in England. Many Quakers were imprisoned (usually on charges either of blasphemy or of causing a disturbance). Their meetings, like those of other dissenters, were outlawed. But continue to meet they did. Things changed in 1687, when King James II issued a Declaration of Indulgence, a measure that was followed by the Toleration Act, passed in 1689 under James's successors, the joint monarchs William and Mary. One group of Quakers, who had met at a house known as Old Jordans not far from Beaconsfield, moved quickly once the Declaration had been issued, building a meeting house by their burial ground. They called the building New Jordans, and Quakers still meet there today. This brick, hipped-roofed building of the late-1680s is for many the archetypal Quaker meeting house. 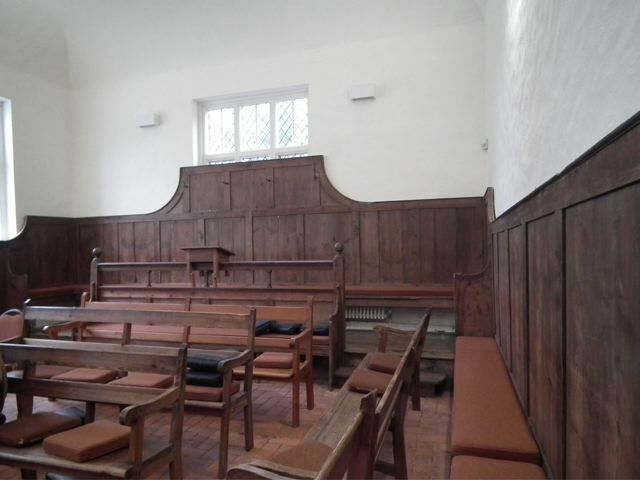 Architecturally, the meeting house looks modest – the Quakers eschewed the grandiose architecture and ornament of Anglican or Catholic places of worship just as they eschewed the churches' hierarchies and rituals. But the building is full of wonderful touches. 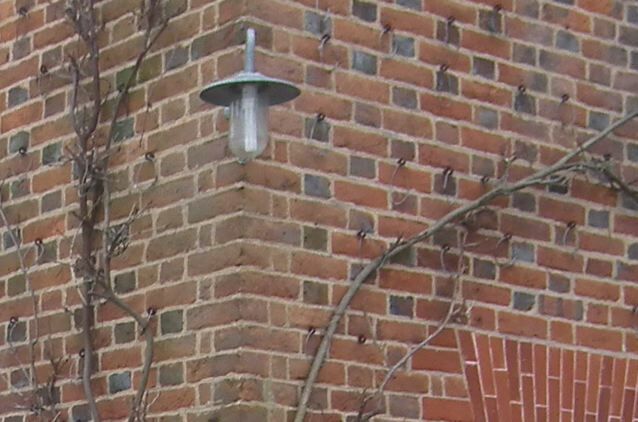 The brickwork has a dappled effect because dark, vitreous bricks are used between the red ones – but the effect is not too dark because only the headers (the short ends) of the dark bricks show, whereas we see the stretchers (the long sides) of the red ones. The curving eaves cornice in white and the shuttered windows are also details that make the building stand out. Inside, it's no less impressive. The main room was panelled in the 18th century, and this woodwork and the plain benches set the tone of the interior. Miraculously, all this survived when the building suffered a major fire in 2005. But, as usual, this place is about much more than the architecture, It is steeped in history. 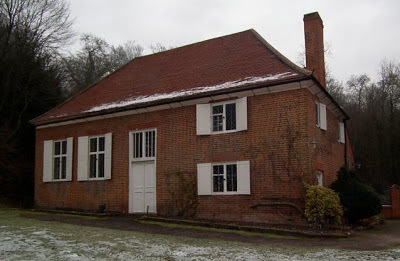 George Fox worshipped at Old Jordans: he died in early 1691 when the meeting house was still new. William Penn, the founder of Pennsylvania, is buried in the graveyard at Jordans, one of a number of early Quakers who are remembered with small stones right in front of the Meeting House. Thomas Ellwood (friend of Milton and inspirer of Paradise Regained), John Bellers (writer on education and early advocate of a national system of hospitals), and Isaac Pennington (writer and great defender of the Quaker movement) were other notable early Friends associated with Jordans. Their work, ideas, and beliefs have had an influence that has spread beyond this small place far across the world. 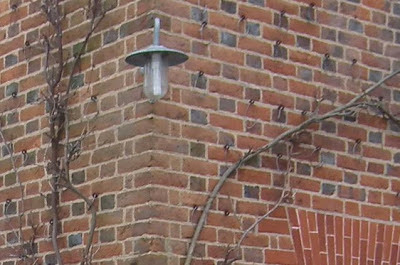 Walls built of small bricks, laid in Flemish bond and with a lovely uneven colour palette ranging from sandy red to raspberry. 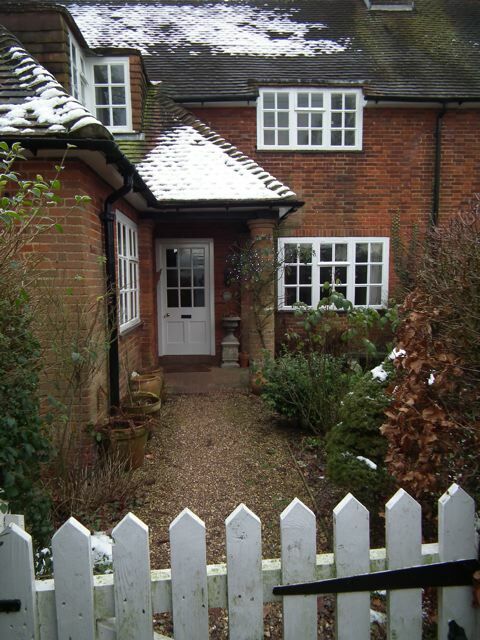 Low eaves, dormer windows, white-painted casements, sashes, and gates, tall chimneys. The houses of Jordans Village, arranged around a rectangular green, are of a piece, and have a timeless quality. 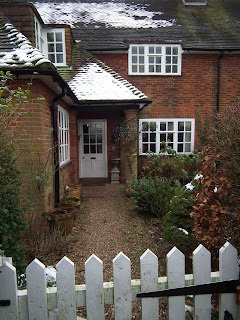 Some could almost be Tudor; or Arts and Crafts houses of the end of the 19th century; or early 20th century outposts of Hampstead Garden Suburb. The last is nearest the truth. Jordans Village was planned in 1915–16 and built as a Quaker community, mostly in the 1920s, not far from the 17th-century Jordans Meeting House (the subject of a future post, I expect) and in part to shield this venerable building from speculative builders, who were eyeing up the neighbourhood because it is within striking distance of the railway line into London's Marylebone Station. The architect of the village was Fred Rowntree, himself a Quaker and a relative of the famous family of confectioners. He produced something with more beauty and character than the spec builders would probably have done. The houses, with their painstaking details like the brick column on this example, look beautiful against a background of greenery and snow – I suspect they would look even better on a sunny day. I visited Jordans with friends who have a longstanding connection to the village, and I can say that the success was not only aesthetic. Jordans was and remains a true community, which not only retains control over the village's buildings (they are owned by Jordans Village Ltd, a Friendly Society) but fosters a network of families and friends that is supportive and sustaining. Some of the light and warmth of the Quakers shone through on the cold winter day of our visit. Friends indeed. 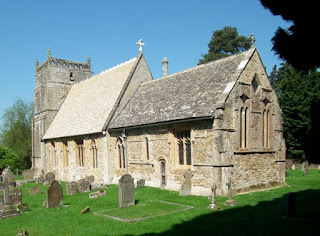 It was assumed just now that one would visit the church from and after the abbey. That is a mistake. One should look at it as part of the fishing and shipping town and reach it from below, i.e. not by car, but by the winding 199 steps. There it is then, when the exertion is over, in a splendid position, low and spreading and battlemented, a wonderful jumble of medieval and Georgian when one walks round it, hard to believe and impossible not to love. 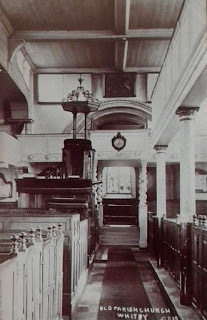 My postcard shows some of the wonderful jumble: the galleries that have colonised most of the upper spaces, the Cholmondeley pew (the bit elevated on twisted columns) that cuts right across the chancel arch, the wooden ceiling that seems a bit too low, the enormous pulpit rising through the middle of it all. It shouldn't work, but it does, somehow, from the finials on the pews to the curlicues on the pulpit, from the twisty columns to the clock on the gallery front, redolent of long sermons on winter evenings. Pevsner had his thoughts on other things than sermons when admiring the box pews: they "positively invite games of hide and seek," he wrote. It was certainly worth the climb, and the church stands magnificently on its cliff top. But there's the rub. The churchyard, which features in Bram Stoker's Dracula, is eroding away. Some more chunks fell off recently, landing soil and bones on the beach below. "Whitby landslip exposes human bones at 'Draclua graveyard'," shouted BBC News, finding it unable to resist the Stoker connection. The bones are regathered and reinterred. Engineers, apparently, are working on the problem of stabilising the cliff and the church, for now, is not said to be under threat. I hope the prospects remain good. On the 150th anniversary of the London Underground, a brief tribute to one of its architects. In 1903 Leslie Green was appointed architect to the Underground Electric Railway Company of London. His job was to design stations for the Bakerloo, Piccadilly, and Northern lines, to make these stations work within the demanding engineering requirements that resulted from building a complex railway network beneath a great city, and to devise a distinctive but consistent style that would make them recognisable. Over the next five years he designed more than 50 stations, creating a visual style, with the now-familiar ox-blood coloured tiles, that became synonymous with the Underground. 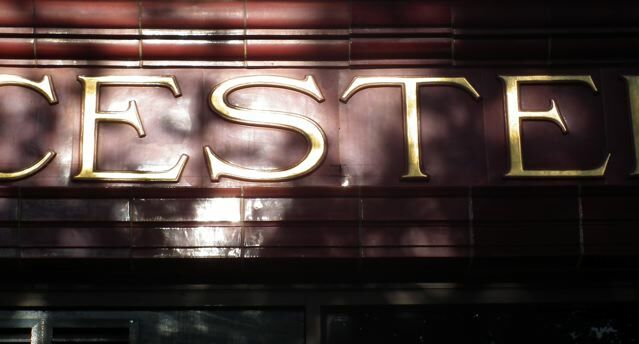 My photograph shows the sun catching some of the gold lettering on the tiles of Gloucester Road station. Green's design style, with Arts and Crafts arches, semi-circular windows, and the ubiquitous tiles, was a success – in developing it, Green could be called one of the fathers of the idea of the corporate identity, and its importance is acknowledged by the fact that many of his stations are now listed. Sadly, Green did not go on to yet more successful architectural projects. He died in 1908, still in his thirties. 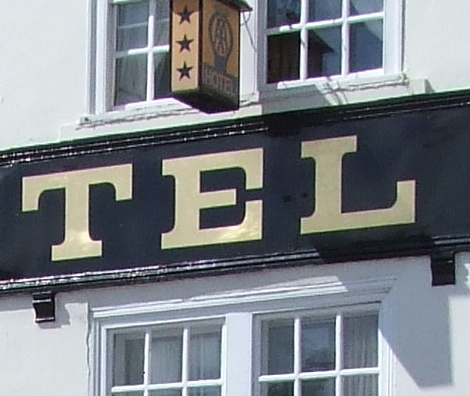 To complete my short series about letters on buildings, here's an example of a fourth kind of lettering, the sort known generally and unflatteringly as the grotesque. These letters are distinguished by their total lack of serifs, the little end strokes that adorn Egyptian, Clarendon, classical and "English" letters† and in the world of print and type this class of letter is known simply as "sans serif". At first glance you could almost believe that some gigantic stamping device has been at work to create this example beneath the pediment of the former Northamptonshire Union Bank in Northampton, but this is stone not concrete and it must have taken a lot of chiselling to incise the these large grotesque capitals. Their unadorned, businesslike quality contrasts with the more delicate carving of the composite capitals below them and the phoenix, with its flames and logs, above. 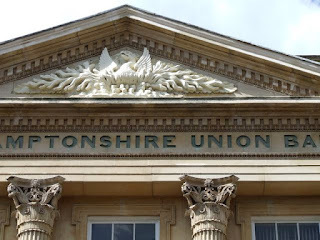 In this context (classical architecture, classical mythology) one might have expected more classical or "English" letterforms, like the ones on Roman inscriptions perhaps, but these plainer ones certainly get the message across. Alan Bartram, whose short book, Street Name Lettering in the British Isles (1978)§, has been a useful guide for me, describes the grotesque letter as "in reality, an Egyptian without serifs", going on to remark that it's an adaptable form that can be used at a wide range of different weights. These Northampton examples are nicely proportioned letters, although the P is rather high-waisted, making its bowl somewhat small and confined. On a modern inscription the letter would probably have a much fuller bowl. But this bank was built in 1841 and in those days that was often how they made, to adapt Shakespeare's phrase, their great Ps. † Readers who would like to see examples of these other classes of lettering can see my other posts on Egyptians in Stroud, Clarendons in Devizes, and "English" letters in Leicester. 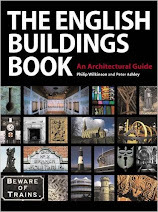 § The companion volumes, Fascia Lettering in the British Isles and Tombstone Lettering in the British Isles are also both worth seeking out via ABE or used book stores. Back before Christmas, I was finding examples of the various kinds of letters found on English buildings of the 18th and 19th centuries. My last example, inspired by a recent visit to Stroud in Gloucestershire, was of the Egyptian letter, with its slab serifs. Here's another type, the clarendon, in which which those serifs are linked to the main strokes with a little curve, to make the whole letter less blocky. These huge letters on the sign of the Bear Hotel in Devizes are some of the biggest I've sen recently – there is absolutely no mistaking the identity of this building, and the huge size of the sign means that I can blow it up with ease so that you can see the little curves clearly on the T, E, and L.
Clarendons also work well on a much smaller scale and are often used on the cast metal signs bearing the names of streets. Although thousands of these old cast signs have been replaced by less attractive plastic ones (on the grounds of saving repainting costs, presumably), there are quite a few still around. 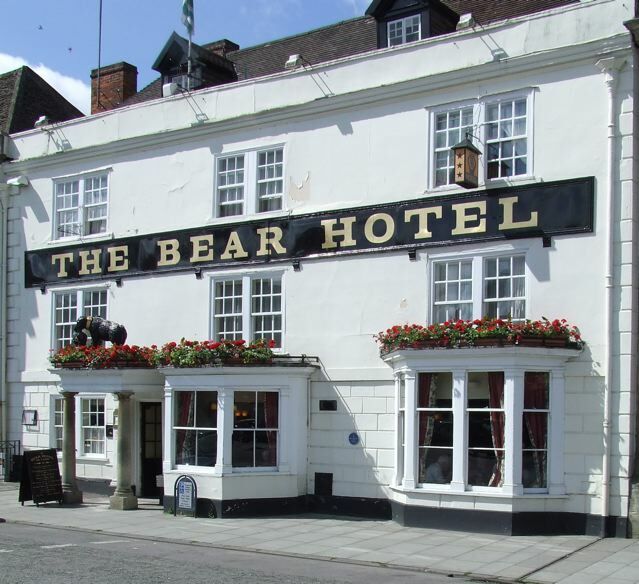 SIgns on the gigantic scale of the Bear Hotel, forming a stripe right across the front of the building, are also quite unusual these days, although the Victorians had a liking for them, often covering commercial buildings with big signs of all sorts. The proliferation of advertising and similar signs is nothing new – but at least painted signs like this one show more care and flair than modern plastic ones.